It’s difficult to describe all of the best things about owning a ranch-maybe it’s the legacy you leave, maybe it’s the time you spend with family working on the land, perhaps it’s a great tax write off or maybe it’s simply a matter of pride of ownership. For me, it’s the little things. It’s getting up in the morning as the sun rises over the mountains and heading outside—protected by several warm layers—to feed my cows. I love the sounds of the sleigh bells tapping against the work horses and the runners on the feed sled cutting through the snow. As winter gives way to spring, the baby calves running and bucking through the field-tails raised up like a flag-remind me of the optimism of new life. A new hay crop grows at a pace I can almost see; the long days of summer and the fertile river-valley soils combine forces to raise acres and acres of brilliant green native timothy and brome grass. It’s the time spent in the tractor breathing in the smell of the fresh cut hay and watching the hawks on a hay bale intently waiting for a confused, doomed rodent to appear. Some of the little things have turned out to be not-so-little. 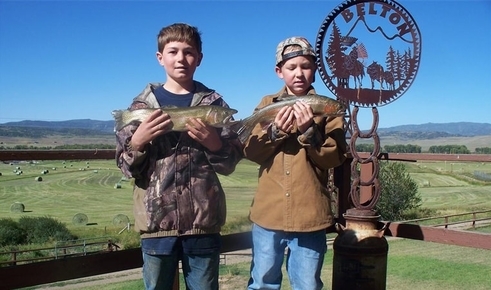 Raising a child on a ranch, taking in young people and helping them to learn about hard work and respect for animals, and sharing our experiences with others certainly rank among the best things about having a ranch. For great shots and videos of some of the best things about owning a Colorado ranch, follow me on Instagram at @christybelton.